NEW location: Lewiston Community Park, 1100 Park Avenue, Lewiston, Idaho! Opening Friday, October 3rd at 6:00 p.m.! This year's maze is all about the University of Idaho's 125th Anniversary! Please note the NEW location of the Clearwater Corn Maze! The maze is located at 1100 Park Avenue (behind P1FCU) off 10th Street in Lewiston, Idaho. The maze is open in October on Friday's from 6:00 to 10:00 p.m., Saturday's from Noon to 10:00 p.m., and Sunday's Noon to 5:00 p.m. A special haunted maze will operate Halloween night, Friday, October 31, from 6:00 to 10:00 p.m. Admission is $6 for those ages 4 and older. 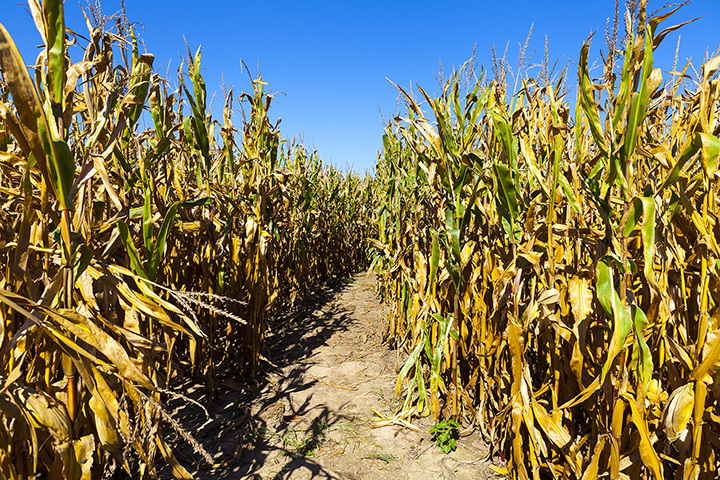 As always, the Clearwater Corn Maze is a collaboration between the University of Idaho College of Agriculture and Life Sciences and Kaufman Farms of Lewiston, Idaho. We would also like to thank P1FCU, CHS Primeland Services, and the City of Lewiston Parks & Recreation Department.